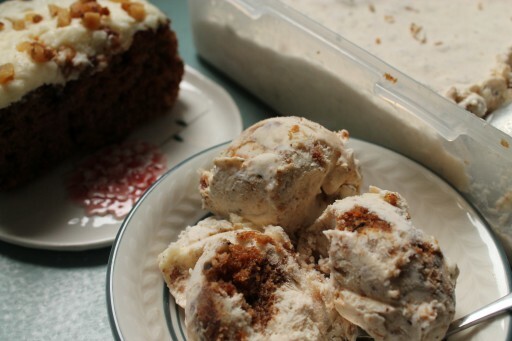 Now as we made this, we were very aware that we were adding nearly a whole cake to an already luxurious ice cream. 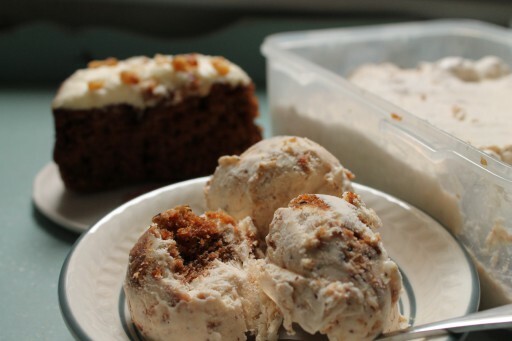 This is why we’ve named it “Decadent Carrot Cake Ice Cream” – as in, be forewarned, this will straight to your hips, your thighs, your arms, your face, your eyelids, your ankles…this isn’t diet food. So for us, this is going straight into the freezer and will wait for us patiently until we’re done with the Whole30. Best reward ever. 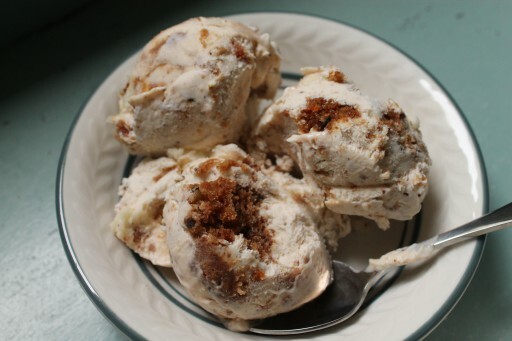 We used our easy ice cream technique and maybe one day we’ll actually use the traditional ice cream method – but for now this is totally foolproof! We like certainty in our lives, especially when it comes to food. You can even add chopped pecans or walnuts…or even raisins, depending on how you like your carrot cake. In a large bowl, add the double cream, condensed milk, cinnamon, ginger, nutmeg and vanilla. Whip for about 15-20 minutes until the mixture has doubled and has the consistency of a thick custard. Cut the cake into chunks (with the frosting intact if it has any!) and fold carefully into the mixture. Freeze overnight or for at least 6-8 hours until frozen solid.